The Blessed Virgin Mary, the Mother of God, appeared six times to three shepherd children (“the Three Seers”) near the town of Fatima, Portugal between May 13th and October 13th 1917. Appearing to the children, the Blessed Virgin told them that She had been sent by God with a message for every man, woman and child living in our century. Coming at a time when civilization was torn asunder by war and bloody violence, She promised that Heaven would grant peace to all the world if Her requests for prayer, reparation and consecration were heard and obeyed. Our Lady of Fatima explained to the children that war is a punishment for sin and warned that God would further castigate the world for its disobedience to His Will by means of war, hunger and the persecution of the Church, the Holy Father and the Catholic Faithful. God’s Mother prophesized that Russia would be God’s chosen “instrument of chastisement,” spreading the “errors” of atheism and materialism across the earth, fomenting wars, annihilating nations and persecuting the Faithful everywhere. The heart of Our Lady’s Message to the world is contained in what has come to be called the “Secret” which She confided to the three child seers in July 1917. The Secret actually consists of three parts, the first two of which have been publicly revealed. The first part of the Secret was a horrifying vision of hell “where the souls of poor sinners go” and contained an urgent plea from Our Lady for acts of prayer and sacrifice to save souls. The second part of the Secret specifically prophesized the outbreak of World War II and contained the Mother of God’s solemn request for the Consecration of Russia as a condition of world peace. It also predicted the inevitable triumph of Her Immaculate Heart following Russia’s consecration and the conversion “of that poor nation” to the Catholic Faith. 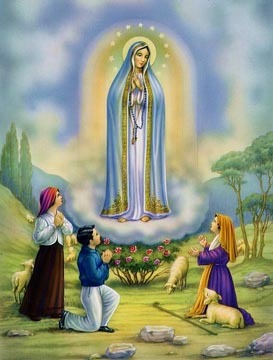 At the time that She confided the Fatima Secret to the three seers, the Blessed Virgin also promised that God would work a great miracle the following October “so that all may believe.” OnOctober 13th 1917, in the presence of 70,000 eyewitnesses, a miracle was worked in the sky above Fatima at the exact moment and in the precise spot that the children had announced earlier. Witnesses recounted that the sun appeared to actually “dance” in the sky and seemed to fall to the ground before resuming its normal place in the heavens. The Catholic Church has officially endorsed the Fatima Message “as worthy of belief” since 1930. Five successive popes have publicly indicated their approval and belief in the validity and critical importance of the Fatima apparitions. Several popes have visited Fatima on solemn pilgrimage and Pope John Paul II has gone at least once in every decade of his pontificate. His Holiness has publicly credited Our Lady of Fatima for saving his life during an assassination attempt in 1981 (which, parenthetically, took place on the 64th anniversary of the first Fatima apparition). The following year, while in Fatima to give thanks for Her intervention, the Pope stated that “the message of Fatima is more relevant and more urgent” today than even when Our Lady first appeared. In the years since the Queen of Heaven’s appearances at Fatima, innumerable books, pamphlets, recordings, films and video programs have been produced as part of a growing worldwide movement of faith and devotion (see Our Lady’s Book Service ). Belief in the Fatima apparations and Our Lady’s full Message are now widely synonymous with an orthodox adherence to the doctrines, rites and traditional practices and teachings of the Roman Catholic Church. Many theologians believe that Our Lady’s Message is uniquely designed for the difficult and trying times in which we live today and suggest that it is Heaven’s intervention to save the world from war, hunger and need, the Catholic Church from apostasy and chaos and the souls of countless millions from eternal damnation. While stern in its warning of the terrible punishments for sin and disobedience, Fatima remains fundamentally a life-affirming and faith-building message of hope and peace for all Catholics and others of good will everywhere.